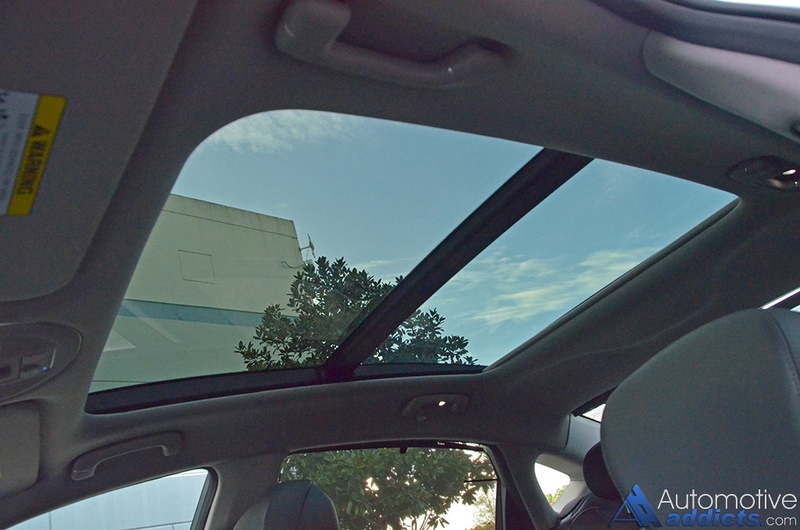 Hyundai’s prominence in the automotive luxury world has proven to be a valiant effort that started with the Genesis sedan when it was first introduced as a 2009 model. 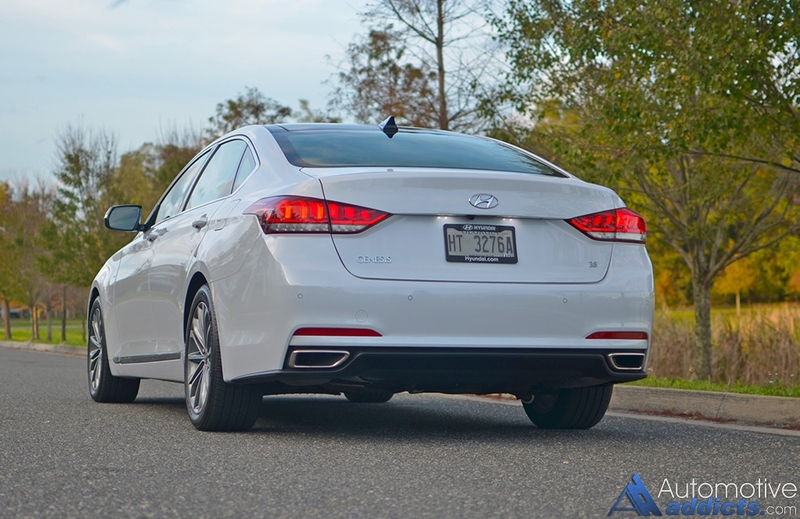 Since that time, Hyundai’s nameplate has thrived with offerings in many mainstream segments to get its feet wet in the luxury spectrum with the Genesis Sedan and large proportioned Equus. 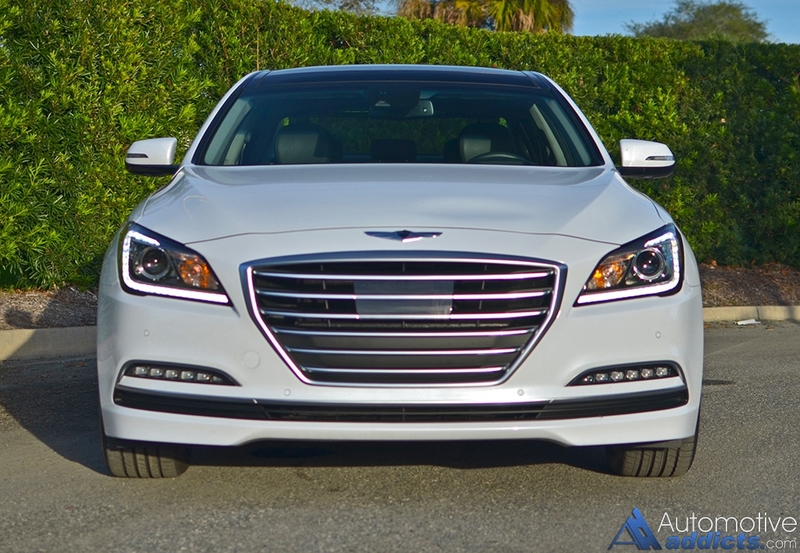 With the introduction of redesigned 2015 Genesis sedan, Hyundai’s attempt to establish a better footing in the luxury segment has paid dividends. After my recent time with the latest 2016 Genesis Sedan I’m even more assured that Hyundai has a valid midsized luxury contender. 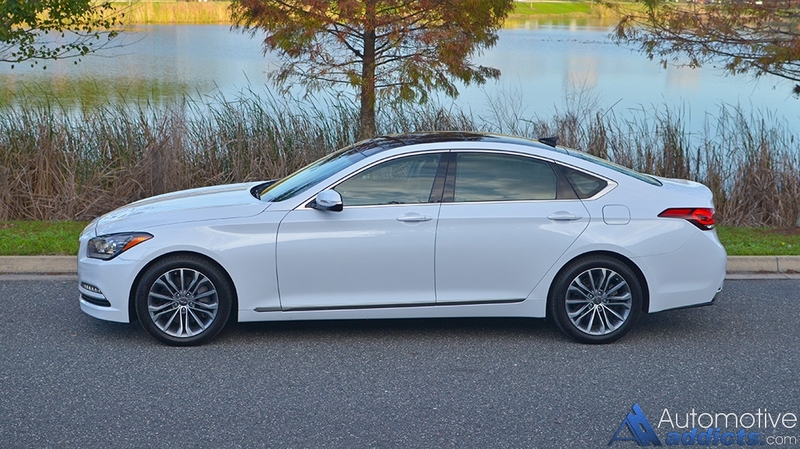 The 2016 Hyundai Genesis Sedan embarks on its second year for the redesigned second generation of Hyundai’s well-praised full-size luxury sedan. For the 2016 model year, the Genesis receives only a few changes surrounding its equipment packaging, which now features HID headlights and LED daytime running lights as standard equipment on all trim levels (3.8, 3.8 AWD, 5.0). Additionally, LED fog lights, previously only offered on the 5.0 liter trim level, are now available as an option on the 3.8 and 3.8 AWD trim levels. Also to note for the 2016 model year, is the 5.0-liter V8 trim now comes standard with the what was offered as the Ultimate Package on the 2015 model year. 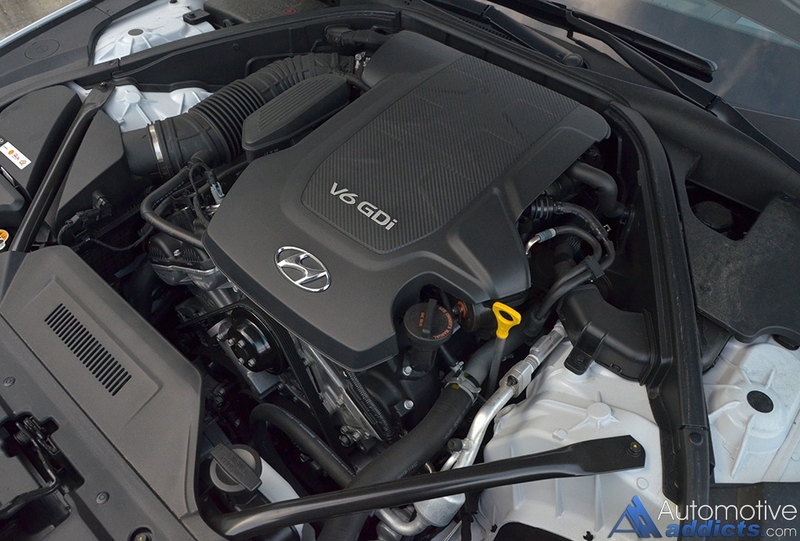 In its base 3.8 trim, as my test vehicle came, the Hyundai Genesis sedan gets a robust direct-injection 3.8-liter V6 engine with 311 horsepower at 6,000 rpm and 293 lb-ft of torque at 5,000 rpm. 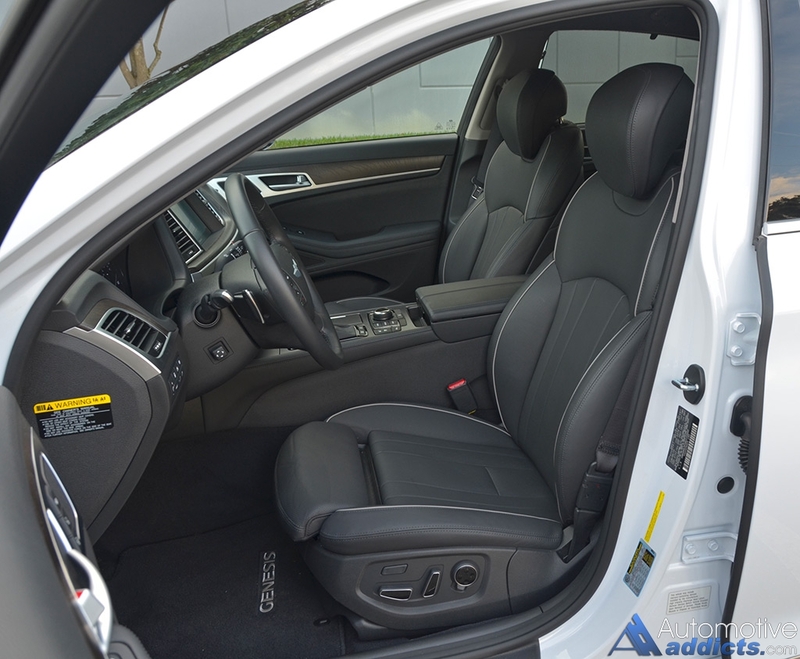 The engine is mated to an 8-speed automatic transmission with a manual shift mode accessed through the shifter or steering-wheel-mounted paddles. The combination of the 8-speed automatic transmission and the eager-to-rev V6 engine make for an assuring dose of power output smoothly transmitted to the rear wheels. Just as I found the 2015 Genesis Sedan 3.8 to be an enthusiastic combination of steady performance with a quiet cabin, one of the quietest for a mainstream luxury sedan, my time with the 2016 Genesis Sedan has been no different. 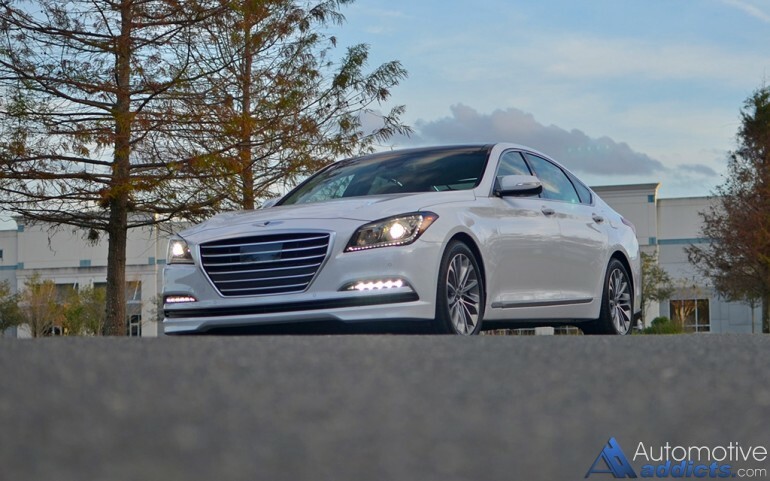 At the top end of its performance capabilities, the Hyundai Genesis 3.8 sedan doesn’t come with many surprises, a good thing considering the balance of a supple ride quality that retains its composure when pushed hard through twisty roads. The braking feel and feedback from the steering inputs tend to get a little lost in translation but prove to live up to the task of performing well in most circumstances. The added weight of the steering feel is a welcomed trait especially when the vehicle is placed in Sport mode, one of three drive modes (Eco, Normal, Sport). 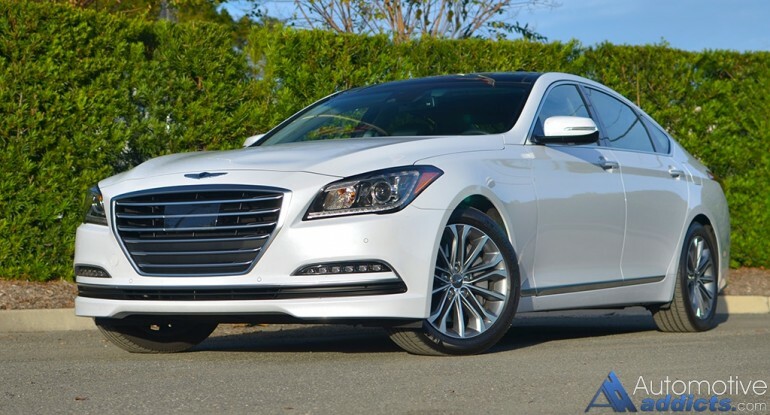 Initially, the Genesis sedan feels big and heavy but that feeling dissipates as you put it through its paces, which increases your assurance in its true abilities to navigate local back roads and highways without fuss. 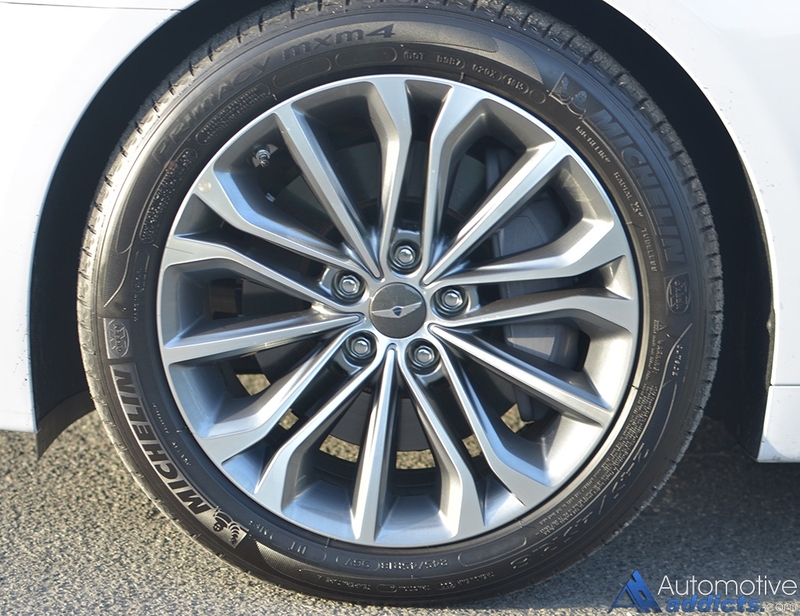 The efficiency of the Hyundai Genesis 3.8 in its rear wheel drive form rests at 22 mpg city and 29 mpg highway. While those numbers may not seem stunning, they are easily attainable in and consistent in real-world driving as my test proved to get a combined 23 mpg with mixed highway and city driving. Expect to get 16 mpg city and 25 mpg highway in the 3.8 all-wheel-drive trim sapping some of the efficiency by the way of its advanced all-wheel-drive system. 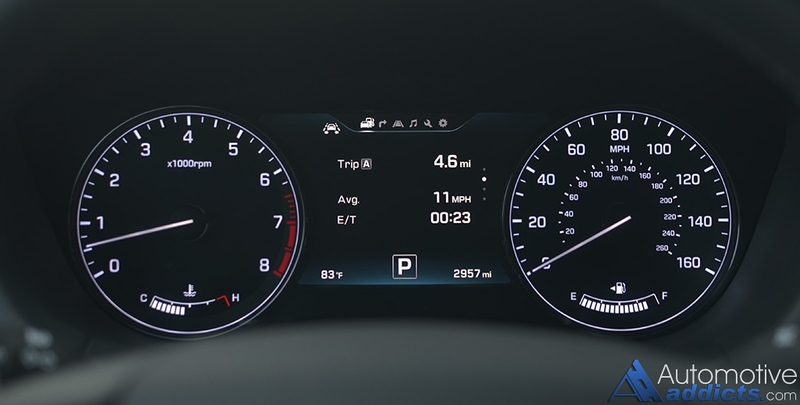 The powerful 5.0-liter V8 trim with 420 horsepower gets 15 mpg city and 23 mpg highway. Hyundai’s effort to design the Genesis sedan to appeal to the masses from an outwardly look seems to take many subtle traits from other well-known luxury brands and make them its own. Not that this “idea” is a bad thing when you take a close gander at the Genesis’ exterior. It just takes a while for some to do a double-take to either find the sole Hyundai badge on the trunk lid or the occult winged Genesis emblem on the hood and the 18-inch alloy wheel center caps to properly identify the vehicle. The identity issues of the Genesis sedan are hard to overlook as Hyundai continues on a road to redefine their luxury placement in the automotive world. It would be prudent to mention the forthcoming luxury branding for Hyundai, which will utilize the Genesis badge and an alpha-numeric naming structure. 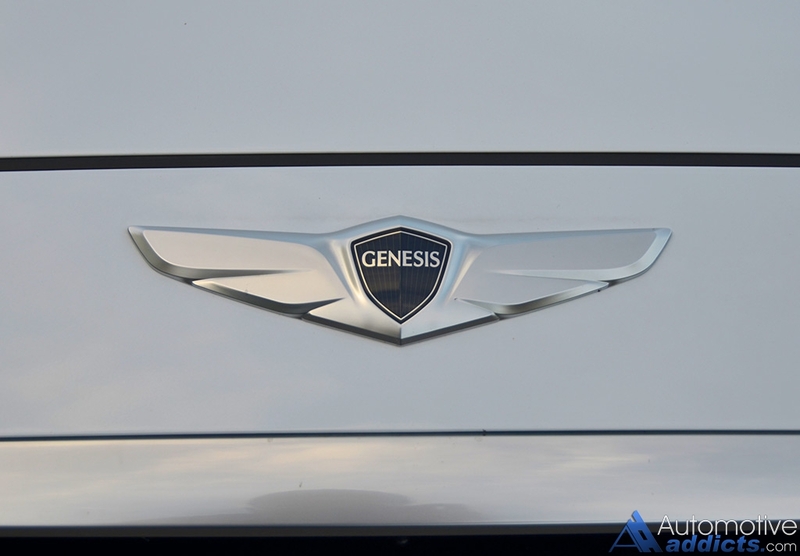 The new branding will include an updated Genesis Sedan carrying the G80 model name while the larger Equus is redesigned and renamed the G90. Other models, such as a luxury sports coupe, will later join the lineup. 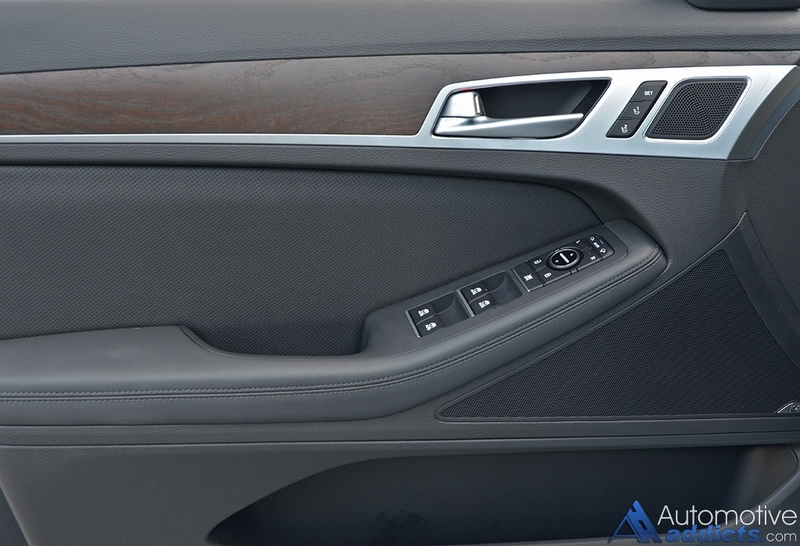 The cabin of the 2016 Hyundai Genesis 3.8 sedan is laced with a wealth of luxury appointments through clever use of minimal plastic trim pieces, plenty of soft-touch surfaces, and admirably textured wood trim. 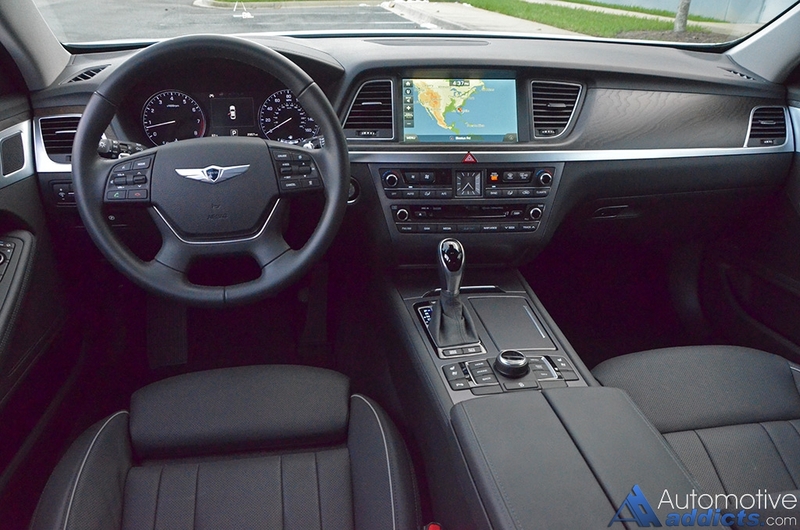 I feel that the Genesis Sedan doesn’t stand out enough inside and out while things like the clever textured wood trim should be utilized in a much more aggressive manner or contrasting color to exude a stronger taste of luxury. While I don’t have any major qualms about the Genesis Sedan’s interior, it could benefit from some boldness to garner the attention that it deserves because it has potential. 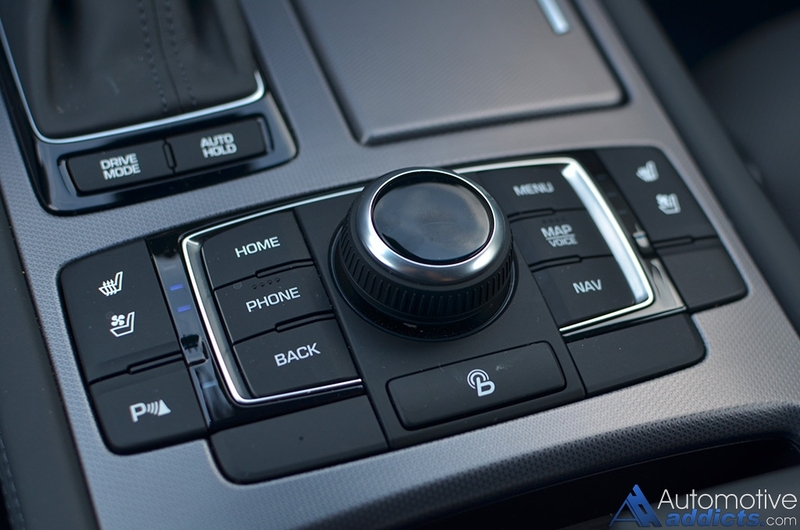 However, Hyundai has gone the extra mile in some aspects, such as the soft textured plastic button surfaces, which go a long way to add another element of luxury into the overall formula. 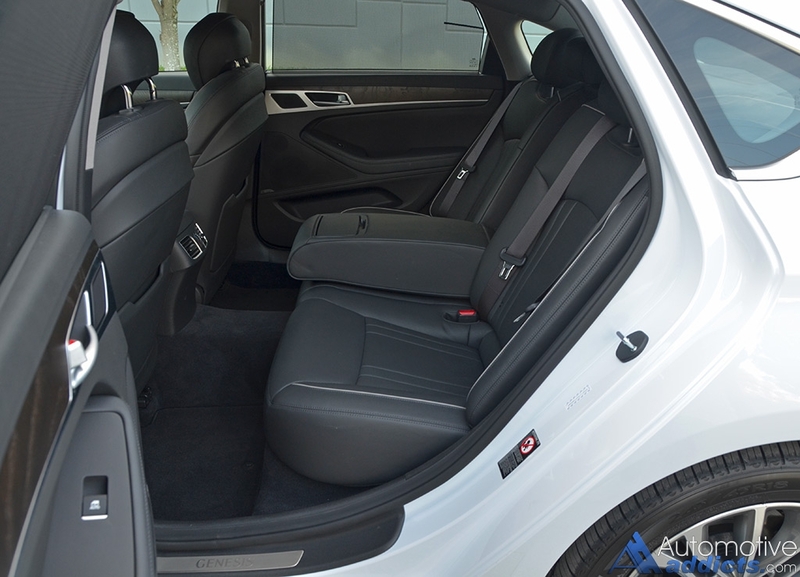 Unfortunately, in my assessment, even with my loaded up test vehicle’s heated, ventilated and power-bolstered perforated leather seats up front, the Genesis sedan doesn’t thrill enough when pitted with the likings of BMW or Lexus. Where the latest Hyundai Genesis 3.8 Sedan in its fully loaded outfit starts to become an attractive luxury proposition is when it comes to its plethora of amenities and active safety features. 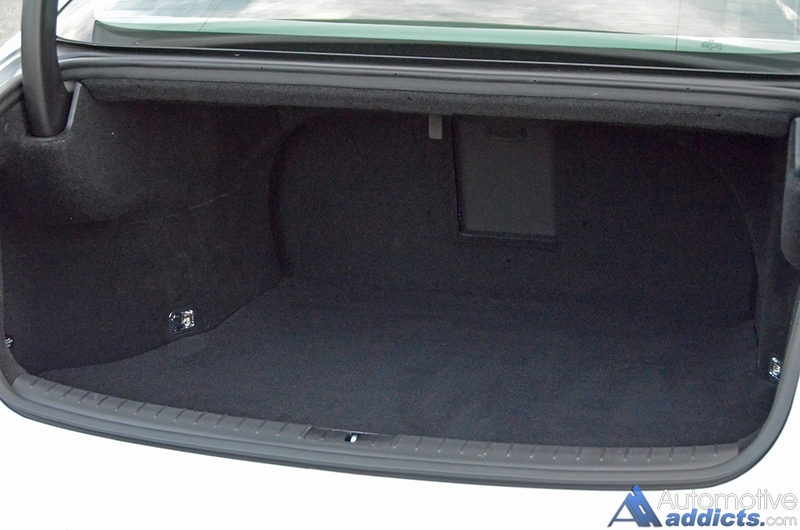 For starters, my Genesis 3.8 Sedan featured a Signature Package featuring a panoramic tilt-and-slide sunroof with a power sunshade, memory driver’s seat, front seat heating and ventilation, LED fog lights, power tilt and telescoping steering wheel, auto-dimming side rearview mirrors, and power rear sunshade with manual rear seat sunshades. The Ultimate Package included on my vehicle dialed up the tech features alongside of the Tech Package, both including the premium perforated leather seating surfaces, a 9.2-inch touch screen for the user-friendly and fast-reacting infotainment system, full color heads up display, dual auto climate control, power opening and closing trunk lid with smart opening, and a bevy of active safety features, such as smart cruise, auto emergency braking, lane departure warning and lane keep assist with haptic steering wheel feedback, auto highbeam, and full front and rear parking sensors. With a plethora of luxury features and amenities in reach, the Genesis Sedan is a genuine contender for the full-size luxury car segment. While its identity has yet to be perfected, the Genesis Sedan has the potential to become world class, and the introduction of the luxury branding will hopefully help accomplish that goal. At the as-tested price of $50,600 for my loaded up Genesis 3.8 RWD Sedan, it undercuts much of its luxury competition. The availability of a thirsty V8 in the 5.0 trim level with only a small bump in pricing only adds to the attractiveness of the Genesis Sedan’s package as an alternative to the long-lived luxury kings. The Genesis Sedan is an enthralling Prince, one that needs to get out more for the world to see him and while his already-remarkable skills are fine-tuned.